For some reason, Mr. Ueno had long been attracted to the countries of the Mediterranean, and in particular, the history and language of Italy. It was when he was attending high school that this interest transformed into a strong desire to travel there. At first he thought of taking the entrance exam for a foreign-language university in order to study languages, but he decided to come instead to Hitotsubashi University, thinking that he could gain a deeper understanding of his interests through studying the social science disciplines. 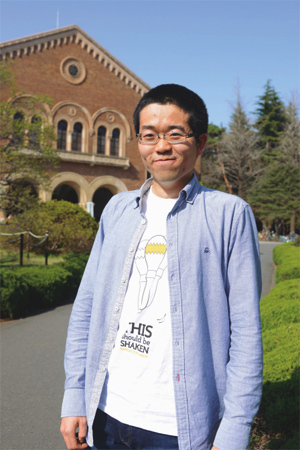 He was interested in the study-abroad program at Hitotsubashi from the start, and considered it an excellent way to make his dream reality. Mr. Ueno’s dream of going overseas came to be realized when he was in the second year of his program. He was selected to participate in a five-week internship program at Bergé in Madrid, Spain. Bergé is the second-largest trading company among unlisted companies in Span, and developed from a shipping business. Hitotsubashi University enjoys an affiliation with them. He was in Madrid when the East Japan Earthquake occurred on March 11th, 2011. The unprecedented disaster was widely reported in the Spanish media as well, and images of the tsunami flashed repeatedly across TV screens. The shock that he and the other Japanese staff members experienced was simply beyond words, but the Spanish staff members attended to them with warm hearts. After experiencing the internship at Berge, Mr. Ueno decided to study abroad at Trent University in Italy as well. It would be lie to say he was not worried about hunting for a job. Indeed, he was aware of the thinking that delaying his graduation for a year might put him at a disadvantage for finding a job. However, his desire to study abroad in Italy overcame these worries. He submitted his application materials to Trent University, but it took a long time to receive information about such things as the types of classes offered, and the sort of preparations required to study there. However, he did not become anxious, as this was also one aspect of Italy. After all, he felt, most of the necessary information was available online, and this just gave him more time to study Italian before his departure. Trent, the town where he went to study, is located in the north of Italy; it is closer to Austria than to Milan. The local industries cooperating with the university have been developing and people from many different countries, including international students, were living there. 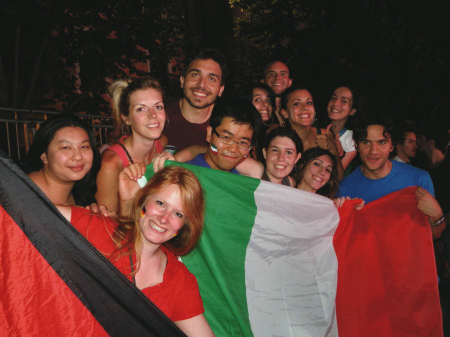 While spending time there as a member of this community and increasing his connections with the local area, he naturally came to feel the characteristics of Italy through his experiences. Watching public-viewing EURO with my friends in Trent; everyone got so excited! The studying itself is important, of course, says Mr. Ueno. However, the effects of studying abroad are not limited to that. Actually living in the location – that action itself can be a chance to change things in one’s life, he believes. Taking advantage of being a student and the accessibility of major cities in Europe, Mr. Ueno actively expanded the range of his activities. In Düsseldorf, he was welcomed by the members of the Josuikai alumni association who were active in local society, which made him realize the spirit of Hitotsubashi University in a world context. Furthermore, while in Trent he had the opportunity to meet Mr. Giorgio Amitrano, who translated the works of Murakami Haruki into Italian for the first time. For instance, if he finds international students who have a hard time being frank with others at a student party, he looks back on his own experience, and is strongly motivated to introduce friends to them. Mr. Ueno is currently working as the student secretary-general at HEPSA (Hitotsubashi University Exchange Program Student Association), which supports the study abroad program. His main role is to support students in various capacities, such as preparing them for their study abroad experience, assisting them upon their return, and facilitating career development. Furthermore, he is interested in international sociology, and is motivated to research immigration issues in Mediterranean countries. His days are filled with various tasks including writing his honors essay, but he is also determined to fully commit to his work at the Secretariat. Originally published in Japanese in HQ (Hitotsubashi Quarterly), the university’s public relations magazine, vol. 39 (July 2013).